Supporting people with disabilities in the community. John's Club is a user led charity for people with disabilities and learning difficulties that live on the Isle of Wight, It welcomes people with special needs, physical or learning disabilities and mental health problems. John's Club provides people with learning and physical disabilities the support that they are unable to access elsewhere, they work in close association with People Matter, which is a User Led Organisation that enables people who use services on the Isle of Wight to have a say on how services are provided. Its Friday Club Nights are very popular and attract around 80 members. This includes a disco and is held in various locations around the island. Every six weeks a special party night is held, which includes a buffet. Clubs are held in Newport on Saturday and Sunday when members enjoy indoor sports, keep fit, arts and crafts and a disco. A self help group is held on Monday evenings when members can have an informal chat and guest speakers are invited in to talk to the group. John's Club will also be running Older Voices The Bay, which is a group for the 50+ age group to address matters affecting them. 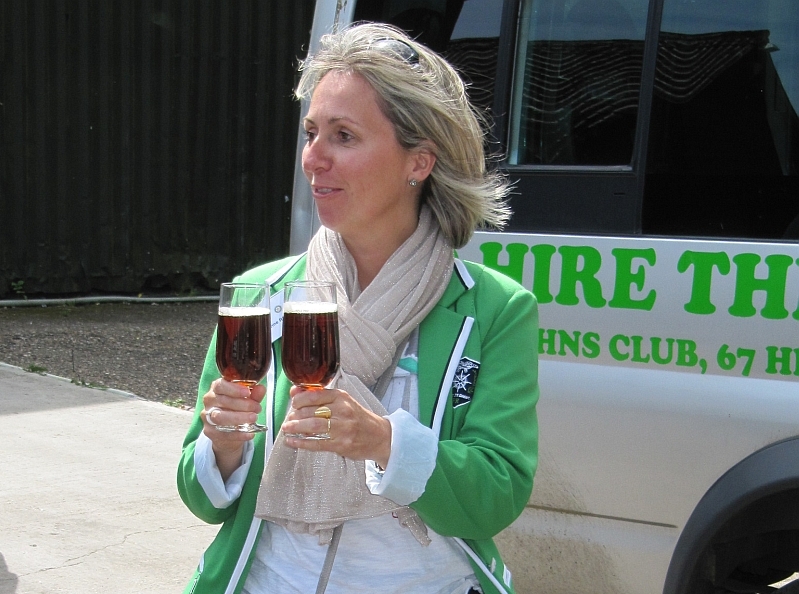 John's Club directly provides social, sporting and educational activities for over 130 members. John's Club recently opened a charity shop and offices in Shanklin which provides invaluable employment and work experience for its members. John's Club have been given the use of a large area of land on which members enjoy growing produce such as vegetables, soft fruit, salad crops, bedding plants and shrubs which are offered for sale in the Quarr Abbey Tea Room. This project encourage people to learn new skills and to expand their knowledge, by providing them with project based activities to run alongside vocational activities taking place on site. The facility is currently open 3 days a week, but is looking to expand this to 5 days a week. John's Club relies heavily on its fleet of minibuses which it uses to transport its members to the clubs and various activities on the island and the mainland it also hires them out to other charitable and not for profit organisations including Isle Care and Age Concern for weekly outings. 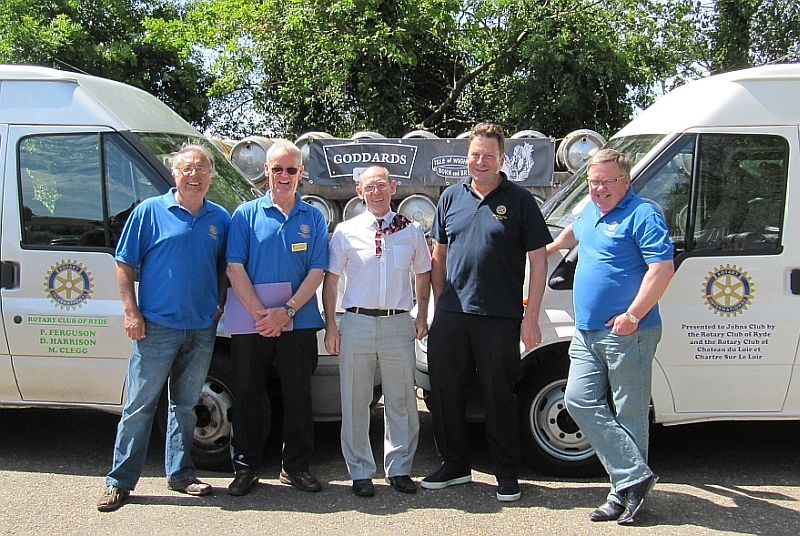 During a weekend visit to the Island in June 2014 by members of Ryde Rotary Club's twinned club The Rotary Club of Chateau du Loir et Chartre sur le Loir, the Clubs were hosted by Goddards brewery. the two 17 seater Ford Transit minibuses were formally presented to John's Club. Pictured shaking hands on the completion of the project are the two club's Presidents. Ryde Rotary Club started its charitable association with John's Club around three years ago after being made aware of the help it required as a user led charity supporting people with disabilities. The Club gave an initial donation of money; and as the association between the Clubs developed the Ryde Rotary Club President, at that time Mark Clegg, gave his own charitable support by servicing the John's Club fleet of vehicles free of any labour charge. 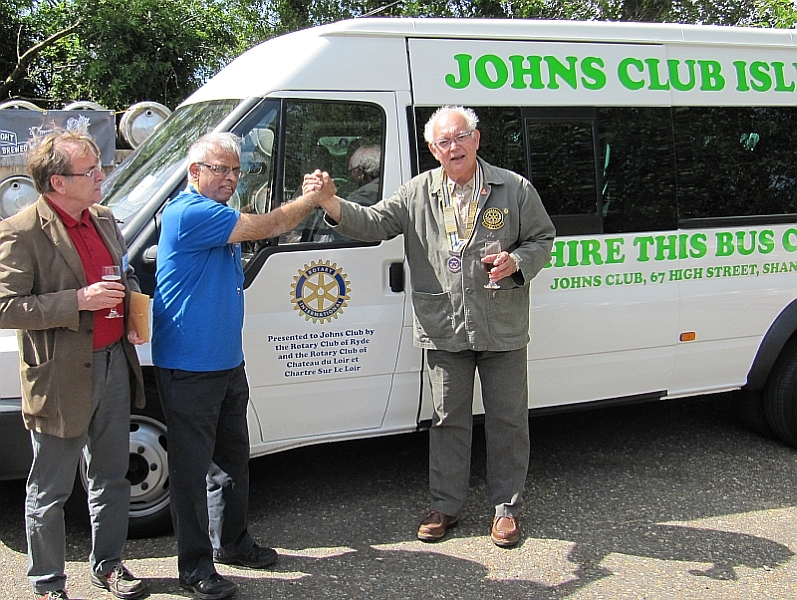 Ryde Rotary Club's association with John's Club continued, and as time passed it became evident that two of the older vehicles in its fleet were in urgent need of replacement. Ryde Rotary Club identified this as a worthwhile charitable project. It was a case of how Rotary could take the funding of this project forward. Pictured above Ctr Johns Phillips from Johns Club and L-R Rotarians Phil Hancock, Mike Turner, Neil Gurney and Mark Clegg. In June 2013 during a Ryde Rotary Club award ceremony the President at that time, Neil Gurney, who was awarding John Phillips of John's Club the honour of a Paul Harris Award for his charitable work, that he announced that the Ryde Rotary Club had agreed to provide a replacement minibus. Soon after that announcement Ryde Rotary Club and two of its members Paul Ferguson and David Harrison donated a sum of money towards the purchase of a replacement minibus. A minibus was purchased and the vehicle was serviced by Rotarian Mark Clegg. 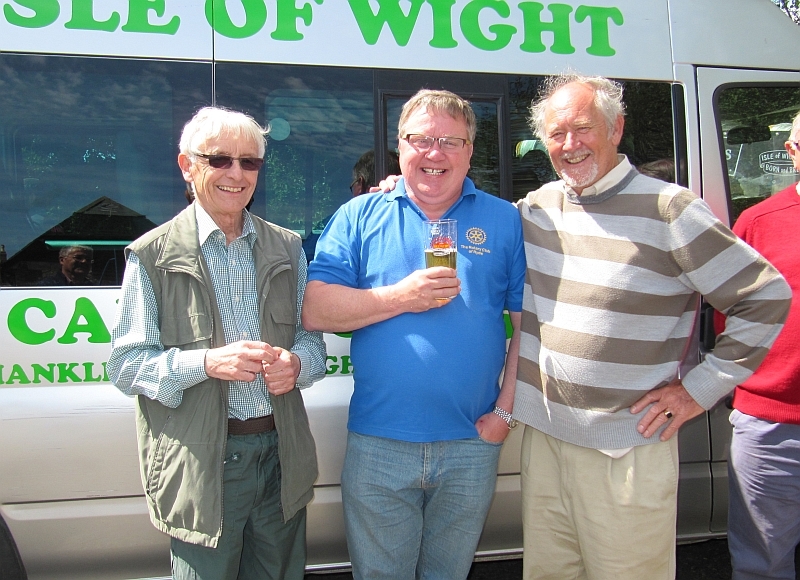 Pictured L-R Rotarians David Harrison, Mark Clegg and Paul Ferguson. Ryde Rotary Club also sought funding to purchase a second minibus. It approached its French twin Club The Rotary Club of Chateau du Loir et Chartre sur le Loir for financial support of the project. Funding was agreed and the monies were matched by the Rotary Clubs respective Districts. The second replacement minibus was then purchased. 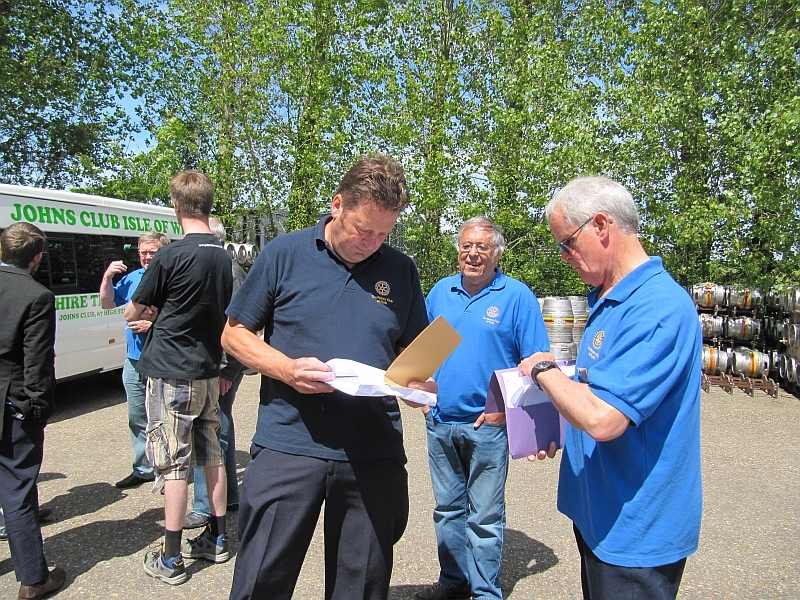 Pictured above are Rotarians Neil Gurney and Mike Turner checking the final paperwork. 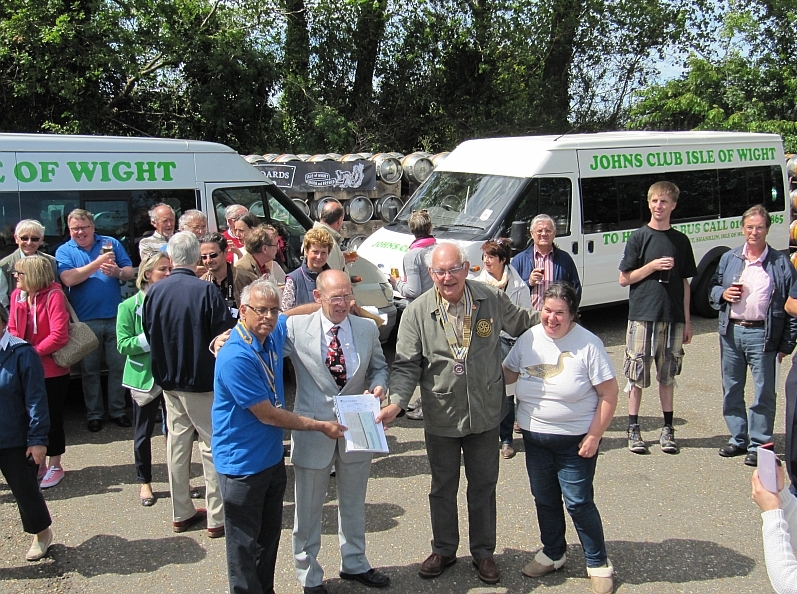 Pictured above are the minibuses being formally presented by the Presidents of The Rotary Clubs of Ryde and Chateau du Loir et Chartre sur le Loir to representatives from Johns Club. 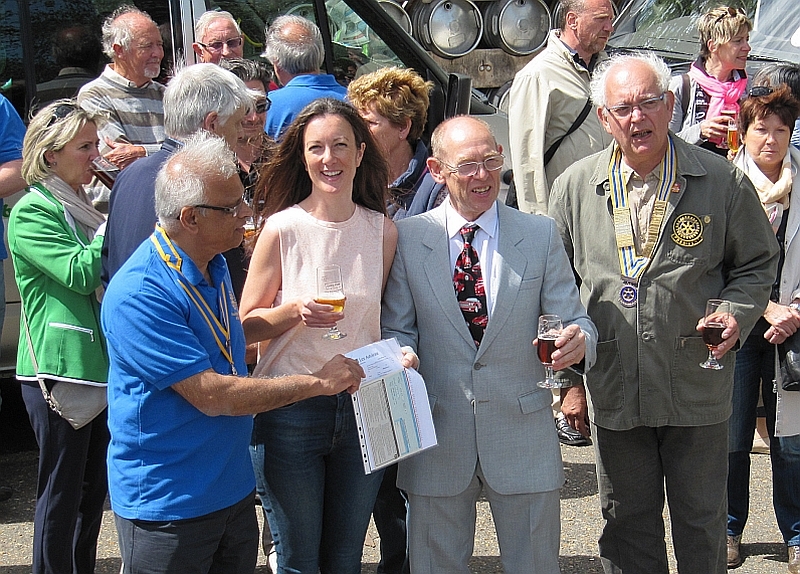 Pictured during the minibuses presentation L-R are Ryde Rotary Club President, Goddards Brewery Henrietta Goddard, John's Club John Phillips and the Chateau du Loir et Chartre sur le Loir Club President.